Students in the Braven Accelerator network with industry and nonprofit leaders who teach them valuable skills that will help them search for their first job post graduation. At the age of 19, San Jose State University junior Nasheli Arce can already visualize how her business career could look. The young woman who spent part of her childhood in a town near Mexico City with her eyes on a global career spends one night a week at Facebook Inc. as part of a course she is taking through SJSU’s College of Science and nonprofit Braven. The Lucas College and Graduate School of Business management information systems major is enrolled in the three-unit Braven Accelerator course, a program created to help underrepresented students attain skills that will help them succeed in their career searches after graduation. Taught both online and in person, one of the main features of the Braven course is small-group work, pairing six to eight students with career coaches from a variety of Silicon Valley high-tech companies and nonprofit organizations. Tianna Hall, a project manager at Facebook, leads Arce’s group. Her group meets at the Menlo Park-based social networking giant. Arce is one of 127 students in this fall’s cohort of the local Braven Accelerator. SJSU is one of only two universities nationwide to form a collaboration with the four-year-old Chicago-based nonprofit along with Rutgers University in Newark, N.J. San Jose State joined with Stanford University and the University of California, Berkeley as part of an initial 10-week pilot program for Braven in spring 2014. After the pilot, Braven officials decided to focus resources solely at SJSU where they felt they could have the biggest impact. The program expanded to a 15-week credit course in fall 2015, according to Andrea Schwartz Boone, executive director of Braven Bay Area. Dr. Melanie A. McNeil, professor of chemical engineering, is teaching the course this fall. “Parts of the course are online, and then students meet in person to practice their skills,” Schwartz Boone said of the class format. 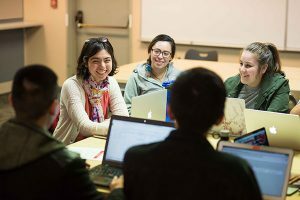 Classes are held Tuesday and Wednesday nights, with sessions held both in Washington Square Hall on campus and scattered about Silicon Valley at the job sites of career coaches such as Arce’s group leader Hall. In addition to Facebook, other coaches work at Google Inc., LinkedIn Corp., eBay Inc., Santa Clara Valley Transportation Authority and Teach for America. Schwartz Boone said she and other members of her Braven Bay Area team began their research for the program by going directly to employers. “We asked what it takes to get hired and what it takes to get promoted at their companies,” she said. In talking with employers, five areas of career-searching competency emerged: the ability to network and communicate, operate and manage, solve problems, work as part of a team and development of self-driven leadership, or softer skills, such as being able to learn from both successes and failures. By the end of the 2017-18 academic year, 600 SJSU students will have completed the Braven program. So far, Schwartz Boone said 96 percent of the students have either graduated or continue to make progress toward their degrees, while 76 percent have had at least one internship as compared to 49 percent of first-generation students at large state schools nationwide. Perhaps most importantly, 75 percent of Braven’s SJSU alumni who have already graduated have secured what Schwartz Boone calls a “strong job” within six months of finishing college. “Strong” jobs are based on salary amounts, health benefits and whether the position requires a four-year college degree. “We are seeing some exciting outcomes,” she said. Dr. Elaine Collins, associate dean of the College of Science, is proud to show off another exciting outcome: two awards recently bestowed upon Braven’s SJSU course. During October, a committee of the CSU/CCC/UC 2017 California Higher Education collaborative Conference recognized the Braven course with its Focus on Efficiency award, while the University of South Carolina’s National Resource Center for the First-Year Experience and Students in Transition gave the program its Institutional Excellence for Students in Transition Award. During the on-site classes, students receive instruction and feedback on their skills not only from the coaches but also from one another, Collins said. The Braven program is geared primarily to sophomores and junior transfer students new to campus, in hopes of helping shape their academic, internship and career trajectory. Collins said team-building exercises help students to develop “stories” about themselves to create an identity and give them a sense of purpose at college. View Braven’s recent Bay Area Report.